Help us with the festival – and enjoy the debates, too! 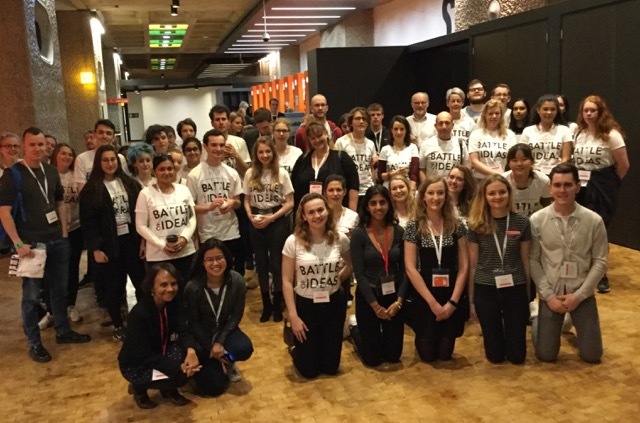 The Battle of Ideas is the Academy of Ideas’s annual weekend festival held at the Barbican, and will be held this year on the 13 and 14 October. With thousands of attendees, hundreds of speakers and over a hundred debates over two days, we need a team of enthusiastic and committed volunteers to support us for the Battle of Ideas 2018. Developing teamwork and organisation skills – great for your CV! We are looking for teams of people to help us both before and during the Battle of Ideas. We cannot guarantee a position in the role you apply for, but we will try our best to find a suitable role that best matches your skill set. We have a lot of information to be uploaded to our website. We need people with great attention to detail, excellent computer skills and the ability to work speedily with us. In the run-up to the Battle of Ideas, we produce a lot of written content. We need people to assist in researching and copywriting to make sure what we produce is accurate and of the highest quality. Applicants will need good English skills to proof read, and be able to work quickly with good attention to detail. The Battle of Ideas is a huge event, but we are still very open to new, exciting and innovative ways in which we can promote the festival, and our global Satellite events before the big weekend. With so many debates happening across the weekend, we need a team of individuals to help us research, write and edit our website and brochure content, including finding supporting reading for all the weekend’s debates. For other interning opportunities with the Academy of Ideas, please click here. We need help with the logistics in the morning and evening particularly with the setting up and packing down of the festival. We run on a very tight schedule to get everything set up on time so efficiency is crucial! With lots of high-profile speakers, guests, volunteers and attendees arriving throughout the weekend, there are lots of people who require help and support. You will be there to give them information, register their attendance and support them in finding their contacts. Event stewards are key to the smooth running of the debates. In working with your room team and Barbican staff, you will need to ensure that debates are ready to go, work with the chair to ensure that debates do not overrun and provide microphone support so that everyone’s contribution can be heard. With this role, you get the additional benefit of seeing lots of the festival’s debates! In this role, you’ll be working more closely with the core team and getting an overall picture of how the event is run. This may involve a wide range of tasks from liaising with team leaders and floor coordinators, to checking that people are in the right place at the right time. The Battle of Ideas has lots of important guests and partnerships with external organisations. We need a dedicated team to meet, greet and liaise with our partners and to ensure sponsored debates are going to plan. As a team leader, you’ll support a group of event stewards to ensure that they understand their roles, and that your room is always supported with Battle volunteers. In this role you will be working closely with the core team, and team leaders, to make sure that everything is running smoothly on your floor. With such a big event running in lots of rooms across six floors, it can be difficult to respond quickly to problems that arise, so floor co-ordinators have a huge responsibility here. If volunteering with the Battle of Ideas sounds like your cup of tea, register your interest using the form here.